There are dozens of scented geraniums with an array of fragrances. The one thing they all share is that their scent comes from their leaves, not the perfume of the flowers. Scented geraniums have glands at the base of their leaf hairs, where the scent is formed. Crushing the leaves releases the oil and the scent. Although Scented geraniums are in the same family as true geraniums and share some similarities, they are a separate genus, along with the popular zonal or annual geraniums. Most scented geraniums have small flowers, some are quite lovely, and some are so tiny you will barely notice them. The leaves can be finely cut or broad and succulent. The scents often mimic other plants, like roses and lemons, and many gardeners enjoy collecting them to grow, both indoors and out. Leaves: Leaves are thick and hairy. There are many different shapes, from round to finely cut and lacy, in shades from gray-green to lime green. Flowers: Each flower has five petals, two larger upper petals, and three smaller lower petals. Most scented geranium varieties are only hardy in USDA Hardiness Zones 10--11, but they can easily be over-wintered as houseplants, or grown as annuals. Full sun to Partial Shade. When grown indoors, scented geraniums will need bright light. They may get leggy indoors and in too much shade. If that happens, you can prune lightly, to create a bushier plant. Size will vary with the particular variety you are growing and the amount of pruning you do. Most scented geraniums grow between 2--3 feet tall and about 1--2 feet wide. There are also some dwarf varieties. Soil: Soil should be well-draining, but not too rich. As with herbs and other plants grown for their essential oils, rich soil can lessen the strength of the fragrance. Scented geraniums will tolerate most soil pH, but a slightly acidic pH of about 6.0--6.8 is ideal. Planting: A handful of varieties can be started from seed, but most are hybrids and will need to be purchased as plants. Small plants are often available in the herb section of nurseries and are usually affordable. You can also easily root cuttings and make more plants. Watering: Scented geraniums are very drought tolerant and don't like sitting in wet soil. Water when the soil feels dry about an inch below the surface. Prolonged periods of dry soil will cause the leaves to turn yellow, then brown and fall off, but the plant will come back again with regular water. Feeding: Go easy on the fertilizer. Scented geraniums are light feeders, and their scent will be stronger if they are grown on the lean side. Potted plants will need more fertilizer than plants in the ground. Potted geraniums can feed a balanced fertilizer at half the label recommended dilution, in the spring and every 3-4 weeks through summer, if they look like they need it. Do not fertilize at all during the winter. Pruning: Occasional pinching and pruning will make your scented geranium plants more full and bushy. If your plant gets to be too large, don't be afraid to prune it back. Spring is the best time to prune because this will give the plants time to set buds and flower. But large plants can handle some cutting back during any season. You can always root the trimmings. It is hard to find a scented geranium that doesn't smell lovely, but here are a handful that stand out. Apple Scented (Pelargonium odoratissimum)—Crisp apple scent and small white flowers. 3 ft.
Chocolate Mint (Pelargonium tomentosum)—Yummy scent Round leaves have a dark center ring. 2 ft.
Mosquito Plant (Pelargonium citrosa)—A song citronella scent. We've never found it particularly effective with mosquitoes. 2 ft.
Variegated Rose Geranium( Pelargonium graveolens 'Variegata') Silver edged, lacy leaves with a rose scent. Plant scented geraniums where you will rub against them; along with a walkway or at an entrance. These are great plants for containers, filling out and spilling over the edges. Scented geraniums are especially nice in individual pots, clustered together. Stems and leaves can be used in arrangements or dried for potpourri. Varieties with dense growing small leaves, like Pelargonium crispum, make nice topiaries and small standards. Scented geraniums are edible flowers, and the leaves are often used to scent foods like sugars and jellies. 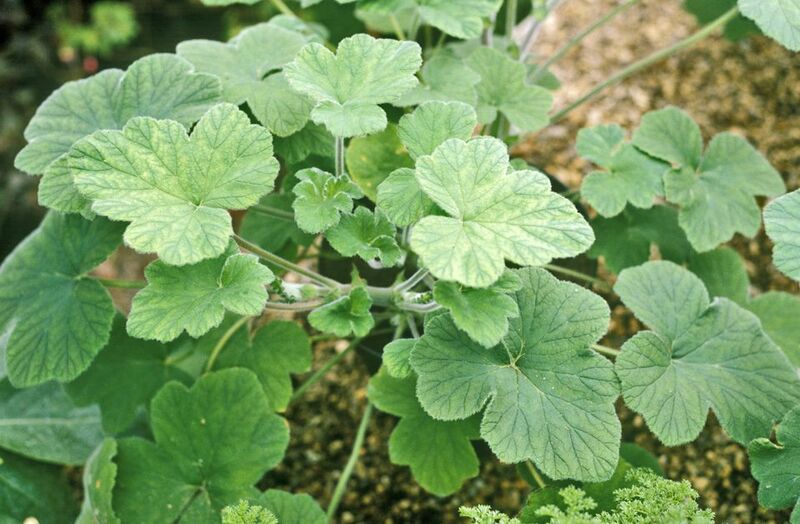 Because of their scent and thick leaves, scented geraniums are usually pest free. White flies are the biggest threat and, less often, aphids, mealy bugs, spider mites might attack. Spraying with insecticidal soap or horticultural oil should get rid of them.